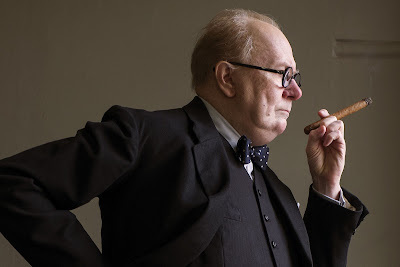 My attention was initially brought to Darkest Hour when the first image was released of Gary Oldman as Winston Churchill, and nobody believed it was actually the actor. I studied that picture for hours, and was still not convinced that it was truly Oldman. There was virtually no resemblance between the actor and the man standing in that photo, and that's really where my interest in the film began. 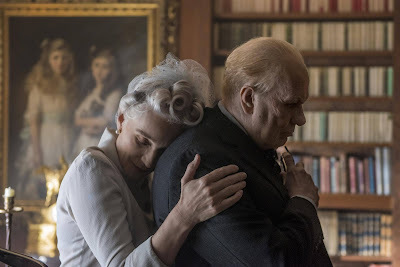 Since then, Darkest Hour has gone on to gain a ton of awards buzz, being talked about as an Oscars front-runner, specifically in regards to Oldman's performance. I have heard nothing by rave reviews about Oldman in this movie, some claiming it to be the best performance he's ever given. However, it seemed like Darkest Hour could be a case where the central performance is fantastic, but the film surrounding it is simply alright, such as last year's Jackie. So I went into the movie convinced I would love Gary Oldman in it, but I was not sure whether I would end up liking the actual film, and I was pleasantly surprised. Darkest Hour does shine a great deal due to Gary Oldman's performance, but it is also a very competent and engaging film in its own right. Newly-appointed British Prime Minister Winston Churchill (Oldman) must navigate how to approach the early beginnings of World War II. Gary Oldman is wholly unrecognizable as Winston Churchill, in the best way possible. He gives the performance of his career, and if he does not win Best Lead Actor at the Academy Awards this year, there will be riots in the streets. I would say he is an absolute lock to win, but you do have Daniel Day-Lewis' final film coming out in Phantom Thread, and you cannot discount Daniel Day-Lewis when it comes to the Oscars. First of all, the makeup work on Oldman is just stunning. The only tiny resemblance I could see in this character on screen to Oldman was his eyes. Other than that, there is no part of this character physically that is Gary Oldman. The makeup people were able to entirely and utterly transform a person, and that is a Herculean feat on their part that they marvelously pulled off. But the transformation doesn't end with his physicality; Oldman is not performing in Darkest Hour, but has rather become Winston Churchill. He has inhabited another human being. I had to keep reminding myself as I was watching the film that not only was it Gary Oldman on screen, but that this was a film and not some sort of dramatized documentary. Every inch of Oldman is transformed, and it results in not just the best performance of 2017, but the best performance I believe Oldman has given in his entire career. He absolutely deserves to take home the Oscar. The characterization of Churchill is also brilliant. He is shown to be a deeply conflicted man, one who has a sense of what the right thing to do is, but constantly doubts himself. He is loud and rude, and feared by many of his colleagues; he is not a perfect person, nor even a necessarily nice person. But through his flaws, you still stand behind him. It's fascinating to think about the fact that there was even question as to whether or not to go to war with Hitler and Nazi Germany, but many British lawmakers want to enter negotiations with Hitler. To the country, Churchill comes across as staunch in his beliefs, but privately he agonizes over whether or not he is making the right decision. The writing, paired with Oldman's performance, brings about the elegance of these sequences, and really gives new depth and dimension to this historical figure. One of the best scenes of the movie is when Churchill speaks with some ordinary citizens on a subway, gauging their thoughts on the potential impending war with Nazi Germany. It brings so much complexity to Churchill, and I really appreciate that level of nuance and sophistication. While Oldman's performance is what shines most about this film, there are other fantastic elements as well. It's beautifully shot, with some truly stunning cinematography. All of the work that went into the design of the costumes and production in order to capture this time period is incredible. You are entirely transported to this time, and it is a transformation that matches Oldman's own character metamorphosis. However, the movie does drag from time to time. While I was wholly invested in Churchill as a character, sometimes the film crawled along in terms of its pacing. 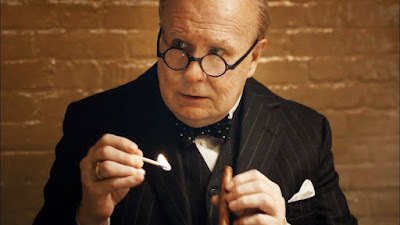 Darkest Hour does try its best to give as much historical context as it can to the diplomatic decisions Churchill is faced with, but it doesn't always explain everything as well as I would have wanted it to. There were times where I was lost as to what was specifically happening, in the larger historical sense. The movie could have done a better job in explaining the historical context, as well as giving the film a faster and stronger pace. Both Ben Mendelsohn and Lily James are really good in the movie in their respective roles as King George VI and Elizabeth Layton, but I found that they didn't have as much screen time as I wanted them to have. Sure, the focus of the film is on Churchill, and rightfully so. But these are characters who have the potential to be really fascinating, and instead they were sidelined. The performances by both actors are really good, but the characters themselves felt slightly underutilized. But in actuality, these are all really minor issues compared to just how riveting Gary Oldman's performance is, and how strong so many of the technical elements of the film are. 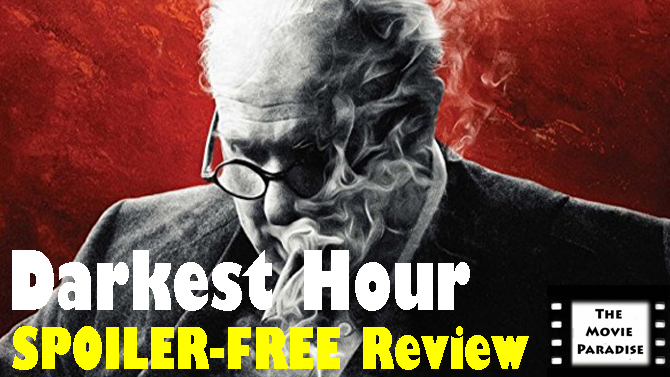 Overall, Darkest Hour is a notable 2017 film, as it gives us probably the greatest performance of the year with Gary Oldman as Winston Churchill. He is entirely unrecognizable, and completely transforms himself for the role. He gives the performance of his career, and absolutely deserves to take home the Oscar for Best Lead Actor this year. Lily James and Ben Mendelsohn are also very good in this movie, though their characters were somewhat sidelined in favor of giving more time to Winston Churchill. While this makes sense for the story that Darkest Hour is telling, I wanted to see a bit more from James and Mendelsohn, as they are both actors I really enjoy seeing on screen. The film does a fantastic job of exploring the complexity and confliction of Churchill as a character, and it really delves into the doubt he had as to whether or not he was doing the right thing. It makes him all the more rich as a character. The production elements are all spectacular too, doing a fantastic job in capturing this time period. However, the film did drag at points, and could have benefited from a quicker pace. It also doesn't do as good of a job as it could have in explaining all the historical context surrounding the film. There were a few points where I was confused as to what was exactly happening, in a larger historical sense. But in the end, Darkest Hour is a great drama that does an excellent job in exploring the character of Winston Churchill, backed by an absolutely brilliant performance from Gary Oldman. What do you think? Have you seen Darkest Hour? If not, are you planning on seeing it? Leave your (spoiler-free) thoughts in the comments section below.